Appointed as Western’s Provost and Vice-President (Academic) for a five-year term on July 1, Fred Longstaffe has a track record in leadership roles since coming to Western in 1987. Longstaffe was Science Dean from 1999 until his appointment as Provost and Chair of the Department of Earth Sciences from 1993 to 1999. He played an instrumental role in the merger of Geology and Geophysics to create the Earth Sciences department in 1993. In addition, he has been an active member of Senate and Board of Governors. While carrying administrative duties, teaching and research have remained important to Longstaffe. He has frequently appeared on the USC Teaching Honor Roll and he received the E.G. Pleva Teaching Award in 2005. Longstaffe received a BSc in geology from the University of Windsor in 1978 and PhD from McMaster University in 1978. His research interests include stable isotope geology and ecology, oil sands and heavy oil deposits, clay mineralogy and environmental geochemistry. 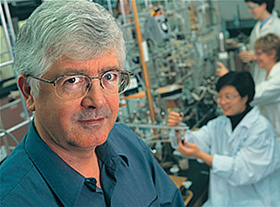 Approximately 15 years ago, Longstaffe established the Stable Isotope Laboratory at Western and has received various awards for his research contributions. Longstaffe says he didn’t expect to be honoured with the award. Friends and acquaintances describe Longstaffe as an effective team builder who is supportive of staff and faculty and who has a capacity for seeing the bigger picture. “He is unique among applicants for this award, in that he has retained an enthusiasm and passion for both teaching and research, despite having extensive administrative responsibilities,” says one of the nomination letters.